Thanks Alejandro for your prior post on The Speakers. I totally appreciate it. Since we were on the South American psyche/rock tip I thought I’d throw in a couple tunes from the very few records I own in this genre. 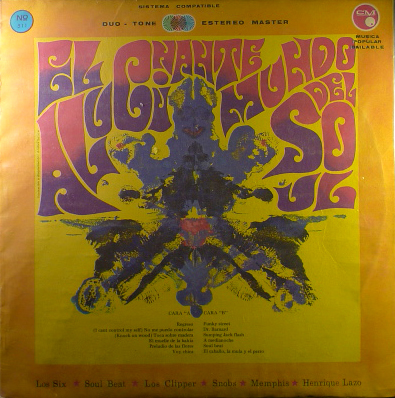 This is a compilation record of Venezuelan rock bands, but I’m only concentrating on the group Los Six, even though this entire album is pretty amazing. I actually found some info on the band from a visual gallery of prog and psyche records (progvinyl.com). Looks like these two songs are taken from their debut self titled album from 1968. Other than that, when I googled “Los Six” all I came up with was “Los Six Pistols” and “Los Six Flags Amusement Park”. The music is a lot more sugar coated than The Speakers, but I’m really digging the Rubber Soul/Revolver-esque sounds these guys put out. Really like the guitar sound of these tracks. Great find! I knew I’ve heard it before! The “Voy chica” track has the melody (note by note but sped up a bit) of the Kinks “Last of the Powered Steam Trains” from The Kinks are The Village Green Preservation Society (with different lyrics)… Do You agree? I think the correct phrase is Psicodelia Venezolana or Venezolano Psicodélico. Tell me if im wrong… I never heared ‘venezuelano’. juancho thanks. yeah Psicodélico o Sicodélico. ive seen them spelt differently. venezilano = my bad. Today “Dr Barnard” randomly popped up in my ipod. What a hilarious great track. Thanks for this gem! “Yo tengo a las chicas locas, loquitas por mi” . Clasico!